LiveJournal is a platform where you can create your own blog and publish the journals or even contribute to the community. Every platform has some limitations and in today’s era of blogging, WordPress is one of the best platforms. If you have decided to move your blog from LiveJournal to WordPress then this guide is for you. You will learn all the things about the migration. The Reasons for migrating your blog from LiveJournal to WordPress. You can publish the journals, create a diary at LiveJournal. It also has the features to protect the blog posts and you can even gather more friends. The community consists thousands of people who can help you explore your blogging passion. But when it comes to the freedom, somewhere it’s lacking. Whereas WordPress is an open source platform which is free. Here, we’re talking about the self-hosted WordPress version. You should read the article on WordPress.org vs WordPress.com. The self-hosted WordPress platform gives its user the best service any platform can provide. You can have a better design, thousands of plugins and no extra coding skills required. In terms of Google indexing, it’s better than others. A Few Things You Would Need To Start A WordPress Blog. For a WordPress blog, you need a domain name and a web hosting. Though most of the web hosting companies give one free domain name with their web hosting plan but you can also buy it from any domain name company. It’s very important to have a web hosting which is reliable, affordable and flexible. There are many web hosting companies but we trust a few. If you want to go with a managed web hosting then WP-Engine is one the best in its segment. BloggingLove users will get the maximum discount possible from InmotionHosting. NOTE : You can directly contact us for more discount. After that, you should know how to install WordPress. You can use one-click WordPress installation. Then for a better design, you can choose any free theme from WordPres repository or you can buy any premium theme. There are many theme providers. You can also hire a web designer to design a custom theme for you. You can also contact us for a custom website. After installing WordPress, you have to import the content from LiveJournal to WordPress. Go to Tools>>Import and you will see many importers. Click on “LiveJournal” importer and install it. It will take a few seconds to install this plugin. Activate it and you will reach to its configuration page. 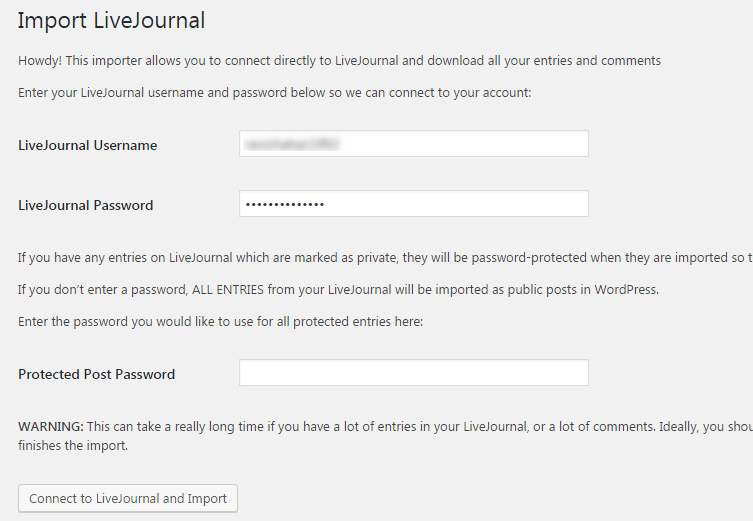 To connect your WordPess CMS, you have to enter the username and the password of your LiveJournal account. There is another section which requires the password for all the protected posts. If you have protected any post at LiveJournal then add a strong password which will be used to access all of your protected posts after migration. Click on the “Connect to LiveJournal and Import” button and the process will begin. Depending on the size of your LiveJournal blog, it will show you the downloading process and within a few minutes, you will see a notification. You can check all the posts on your WordPress blog. The Things You Can’t Import. Unfortunately, LiveJournal doesn’t let you important the post images. You manually have to upload those images to your WordPress media library. And there is no option to redirect your LiveJournal blog to WordPress. It’s like starting out again. Your LiveJournal visitors wouldn’t able to see your WordPress blog until you make them know. Maybe writing a blog post on LiveJournal can help you. Once you make sure, you can deactivate your LiveJournal account. Some Essential Steps To Take After Migration. After the procedure to move your blog from LiveJournal to WordPress, you should do the basic WordPress settings. Go through the WordPress admin panel and fill the required details in the settings’ section. Add the website name, the tagline, and all other things. A WordPress website is handled with the use of its plugins and you should never forget to install the important plugins. Use the contact form plugins to create a contact us page which can help your readers to contact you. Add your WordPress website to Google Search Console to get indexed. There are many other things you can learn about WordPress. If you need any help, feel free to drop a comment. This piece of content is very helpful for the LiveJournal users who want to migrate on WordPress. I think WordPress is the perfect fit bloggers like us. It is fast, easy, free and highly customizable. Thank you for sharing this post. Indeed useful. In this fastest growing blogging world, people are more aware than ever before. But there are still a few people who are using the platforms like LiveJournal to share their ideas. As soon as they get an insight about WordPress, they would want to migrate and no platform is good as WordPress to do so.